Liberal voters want quotas. They also want a federal corruption body to look at what many voters believe is “widespread corruption” in politics. 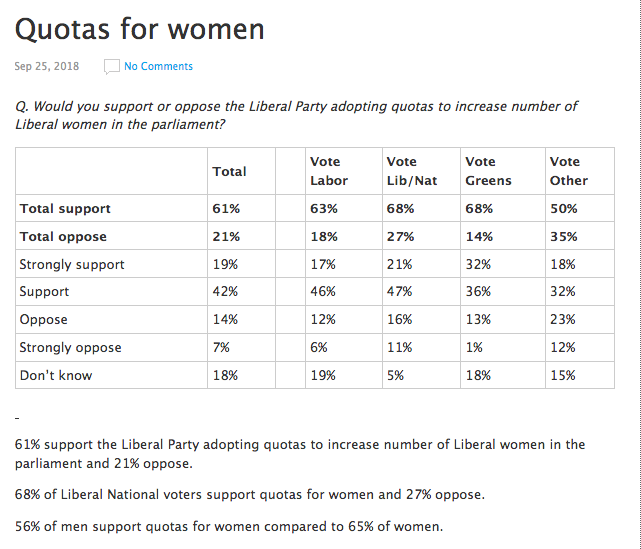 An Essential poll released today shows 68 per cent of Liberal voters want quotas to increase the number of Liberal women in the parliamentary party. Prime Minister Scott Morrison has asked his party to come up with ways to get more Liberal women into parliament, but so far has refused to back a Labor-style quota system. The Liberal Party adding quotas to get more women into parliament won support from 63 per cent of Labor voters and 68 per cent of Greens. Morrison’s predecessor Malcolm Turnbull also looked at a federal anti-corruption body, but had hedged on Labor’s plans to introduce one. Liberal voters though are strongly in favour of a national body to investigate politicians and public servants, with 87 per cent of them backing the proposal. The poll found 82 per cent of Labor voters and 85 per cent of Green voters also supported the idea. Overall, the poll found the Liberal primary vote is up two points to 34 per cent, while Labor is down one point to 36 per cent. But Labor is still leading the two-party preferred vote 53 per cent to 47. The poll of more than 1000 Australians was conducted from September 20 to 23.